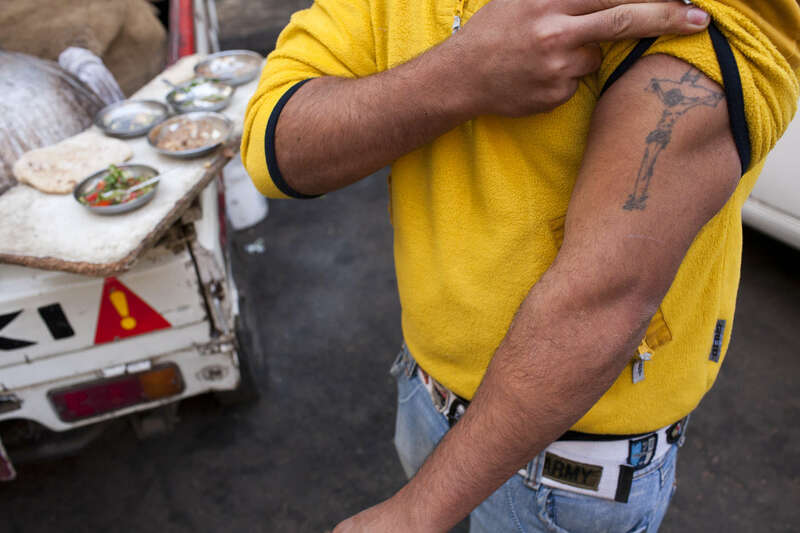 Walid, a young Zabaleen man, shows his tattoo of Jesus Christ on the cross. The Zabaleen are a community of around 25, 000 Coptic Christians living in the Cairo uburb of Moqqatam. Zabaleen, which literally means “garbage collectors” have assumed a semi-official role as Cairo’s binmen. The Zabaleen men usually do two shifts. They leave at about four or five in the morning, and again at about nine. The poorer Zabaleen use donkey carts, but many earn enough to rent trucks. They then take the garbage back to their homes for the women to pick through for items to recycle.